What kid doesn’t love learning about and coloring dinosaurs? 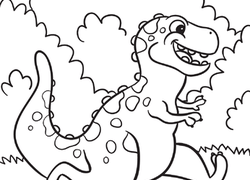 We have the perfect dinosaur worksheet or coloring page for your little Jurassic lovers, from colour-by-number and connect-the-dot activities to dinosaur matching games, maths worksheets, and inspiring story starters. Your young paleontologist will have a blast learning all about these fascinating prehistoric creatures while getting some essential skills practise along the way! 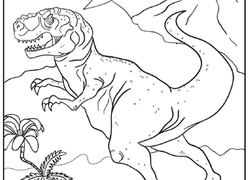 This colour by number coloring page enters the world of dinosaurs and prehistoric earth. Bring the page to life one number and colour at a time! 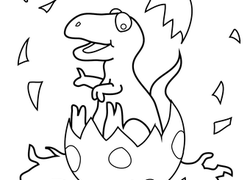 Kids are sure to love coloring this good-natured dinosaur. 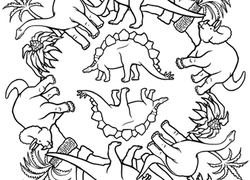 A coloring page for kindergarteners about prehistoric sea animals. This one is of a megalodon, a giant shark that lived under the sea many years ago. 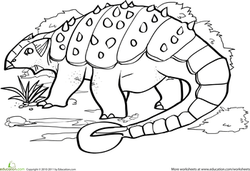 Teach your child all about the Ankylosaurus with this great dinosaur coloring page. Who is this fearsome dinosaur? 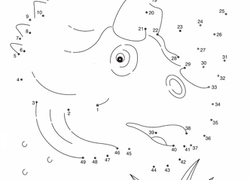 Have your child complete the drawing by filling in the dot to dot. Remember to count in even numbers only! This prehistoric coloring page features a Tyrannosaurus Rex running in front of a volcano, with a Pterodactyl flying up above. 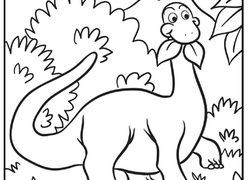 Preschoolers are sure to love coloring this adorable dinosaur, and will practise recognizing the letter D while they're at it!